Thoracic spinal cord injuries may affect one or both sides of the body, and although the long-term prognosis is good, early treatment is still critical. The thoracic spine consists of 12 vertebrae levels. The are located at the middle of the spine, between the cervical and lumbar vertebrae. Thoracic vertebrae are considered as those that have a rib. These levels are classified as T1 - T12. 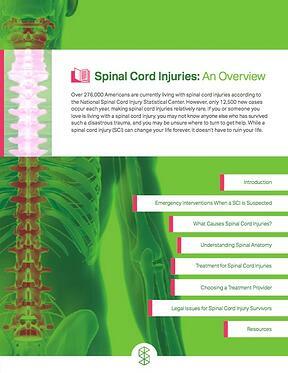 Thoracic spinal cord injuries are severe, however rarely cause death. Thoracic spinal cord injuries may affect one or both sides of the body, and although the long-term prognosis is good, early treatment is still critical. The thoracic region of the spinal column is made up of 12 segments referred to as T1 - T12. It is located in the middle of the spine between the cervical and lumbar levels. The 12 thoracic vertebrae which make up this section of the spine connect directly to the rib cage. Nerve roots exit the spinal column at each vertebral level of the spine. The nerves and spinal cord at the thoracic level communicate with the central parts of the body. The T9, T10, T11, and T12 vertebrae form the base of the thoracic spine. The thoracic spine is made up of 12 segments total between the cervical and lumbar levels. Sections T9 - T12 are known as transition vertebrae because of their proximity and similarity to the lumbar vertebrae. The spinal cord and nerves correllation to these levels, along with the rest of the thoracic spine, aid in controlling the trunk of the body. 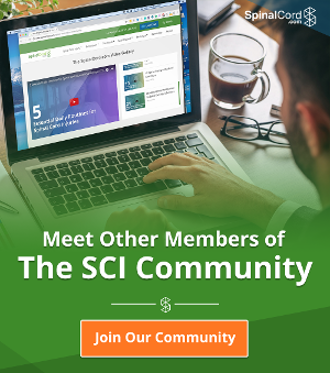 Patients with thoracic spinal cord injuries live very independent lives. T1 is the highest level in the spine where the damage will leave the patient with use of their hands. Thoracic spinal cord injuries are serious enough to require immediate medical treatment. The expected prognosis for these patients is great as they are very likely to live normal lives with minimal modifications. The most limiting factor of a thoracic spinal cord injury is the inability to control bladder and bowel function, but the patient is able to adapt to this quickly. Physical therapy will be an important part of rehabilitation for thoracic spinal cord injury patient. Patients with injuries to the spinal cord between T6 - T12 have a good ability to control their torso while sitting, thus physical therapy will be a critical part of recovery. These patients will do gait training so they may learn to use walking devices, and retain the remaining function in their lower body. Patients will also participate in occupational therapy to learn to use their hands; this may be difficult in the beginning, as well as learn to dress and bathe independently. Occasionally speech therapy is used for those patients with injuries to their spinal cord in the upper thoracic spine as they may have reduced abilities immediately after injury. Psychiatrists are helpful for spinal cord injury patients. Mental health is key to recovery, so these therapists are used to keep the patient in the best mind frame for recovery.